The Presque Isle Lodge, located on Grand Lake midway between Rogers City and Alpena, is the ideal place to center a moderate-sized family reunion or other family gathering.This spacious Lodge is designed and furnished to accommodate groups that want to spread out, congregate in numerous small gatherings to reminisce, but who want a centralized retreat for group meetings and meals, and/or to relax after a busy day exploring the area. Your group can gather in the lounge to chat or to curl up beside the fireplace with a good book. If you want to just sit back and relax, enjoy the lounge chairs or the porch swing. Guests will find refrigerators, microwave, a grill, ping pong table, as well as plenty of games to keep you occupied on rainy days. The Presque Isle Lodge will accommodate up to 125 people for group meetings and meals. It will comfortably sleep 16 adults. More possible with special arrangements. The Presque Isle Lodge is located near the Grand Lake Association Park with amenities such as a tennis court, swings, slides, jungle gym, volleyball court, and basketball court that both children and adults will love to use. Grand Lake is a 5,660 acre lake with 19 islands to explore. Enjoy swimming, fishing, canoeing, or just relaxing on the hammock or deck. 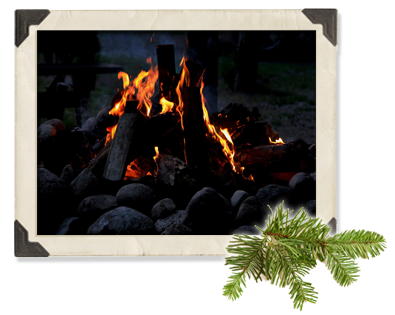 Enjoy evening gatherings and sing-a-longs around the several fire pits. Furthermore, the Presque Isle Lodge is at the center of extensive recreational resources – such as Grand Lake, Lake Esau, Lake Huron, the Sweetwater Trail, Thompson’s Harbor State Park, Besser Natural Area, diving, museums, lighthouses, gift shops, and much more. 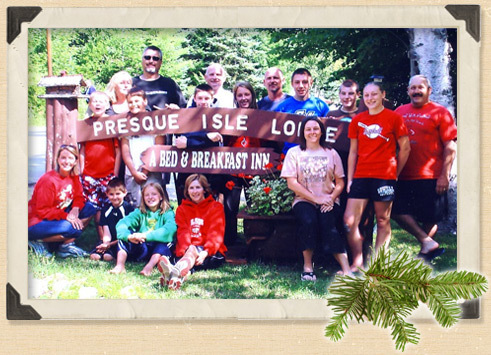 And for those who just want to get away from it all, the Presque Isle Lodge is a great place to watch birds, deer, squirrels or gaze at the wondrous sunsets over Grand Lake and share special memories with family members and old friends. 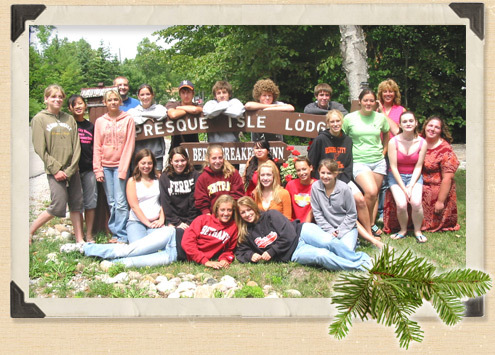 You will have great, lasting memories of that “very special” reunion you held at Presque Isle Lodge. answer any questions for you.